The purpose of the ASIL Studies in International Legal Theory is to clarify and improve the theoretical foundations of international law. Too often the progressive development and implementation of international law has foundered on confusion about first principles. This series raises the level of public and scholarly discussion about the structure and purposes of the world legal order and how best to achieve global justice through law. This series grows out of the International Legal Theory project of the American Society of International Law. 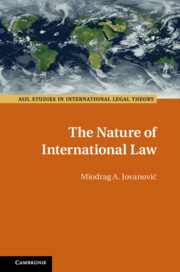 The ASIL Studies in International Legal Theory deepen this conversation by publishing scholarly monographs and edited volumes of essays considering subjects in international legal theory.